Liquorice (British English) or licorice (American English) (/ˈlɪkərɪʃ, -ɪs/ LIK-ər-is(h)) is the root of Glycyrrhiza glabra from which a sweet flavour can be extracted. The liquorice plant is a herbaceous perennial legume native to the Middle East, southern Europe, and parts of Asia, such as India. It is not botanically related to anise, star anise, or fennel, which are sources of similar flavouring compounds. Liquorice flavours are used as candies or sweeteners, particularly in some European and Middle Eastern countries. Liquorice extracts have been used in herbalism and traditional medicine. Excessive consumption of liquorice (more than 2 mg/kg/day of pure glycyrrhizinic acid, a liquorice component) may result in adverse effects, such as hypokalemia, increased blood pressure, and muscle weakness. The word "liquorice" is derived (via the Old French licoresse) from the Greek γλυκύρριζα (glukurrhiza), meaning "sweet root", from γλυκύς (glukus), "sweet" and ῥίζα (rhiza), "root", the name provided by Dioscorides. It is usually spelled "liquorice" in Commonwealth usage, but "licorice" in the United States. It is a herbaceous perennial, growing to 1 metre (39 in) in height, with pinnate leaves about 7–15 cm (3–6 in) long, with 9–17 leaflets. The flowers are 0.8–1.2 cm (1⁄3–1⁄2 in) long, purple to pale whitish blue, produced in a loose inflorescence. The fruit is an oblong pod, 2–3 cm (3⁄4–1 1⁄8 in) long, containing several seeds. The roots are stoloniferous. The scent of liquorice root comes from a complex and variable combination of compounds, of which anethole is up to 3% of total volatiles. Much of the sweetness in liquorice comes from glycyrrhizin, which has a sweet taste, 30–50 times the sweetness of sugar. The sweetness is very different from sugar, being less instant, tart, and lasting longer. The isoflavene glabrene and the isoflavane glabridin, found in the roots of liquorice, are phytoestrogens. Liquorice, which grows best in well-drained soils in deep valleys with full sun, is harvested in the autumn two to three years after planting. Countries producing liquorice include India, Iran, Italy, Afghanistan, the People’s Republic of China, Pakistan, Iraq, Azerbaijan, Uzbekistan, Turkmenistan and Turkey. The world's leading manufacturer of liquorice products is M&F Worldwide, which manufactures more than 70% of the worldwide liquorice flavours sold to end users. Most liquorice was once used as a flavouring agent for tobacco for flavour enhancing and moistening agents in the manufacture of American blend cigarettes, moist snuff, chewing tobacco, and pipe tobacco. Liquorice provided tobacco products with a natural sweetness and a distinctive flavour that blends readily with the natural and imitation flavouring components employed in the tobacco industry. As of 2009, the US Food and Drug Administration banned the use of liquorice as a "characterizing flavor" from manufactured tobacco products. Liquorice flavour is found in a wide variety of candies or sweets. In most of these candies, the taste is reinforced by aniseed oil so the actual content of liquorice is very low. Liquorice confections are primarily purchased by consumers in Europe, but are also popular in other countries such as Australia and New Zealand. In the Netherlands, liquorice confectionery (drop) is one of the most popular forms of sweets. It is sold in many forms. Mixing it with mint, menthol, aniseed, or laurel is quite popular. Mixing it with ammonium chloride (salmiak) is also popular. A popular example of salmiak liquorice in the Netherlands is known as zoute drop (salty liquorice), but contains very little salt, i.e., sodium chloride. Strong, salty sweets are also popular in Nordic countries. Dried sticks of the liquorice root are also a traditional confectionery in their own right in the Netherlands, although their popularity has quickly waned in recent decades. They were sold simply as sticks of zoethout ('sweet wood') to chew on as a candy. Through chewing and suckling, the intensely sweet flavour is released. The sweetness is 30 to 50 times as strong as sucrose, without causing damage to teeth. Since about the 1970s, zoethout has become rarer and been replaced by easier to consume candies (including 'drop'). Pontefract in Yorkshire, England, was the first place where liquorice mixed with sugar began to be used as a sweet in the same way it is today. Pontefract cakes were originally made there. In County Durham, Yorkshire and Lancashire, it is colloquially known as 'Spanish', supposedly because Spanish monks grew liquorice root at Rievaulx Abbey near Thirsk. In Italy (particularly in the south), Spain and France, liquorice is popular in its natural form. The root of the plant is simply dug up, washed, dried, and chewed as a mouth freshener. Throughout Italy, unsweetened liquorice is consumed in the form of small black pieces made only from 100% pure liquorice extract; the taste is bitter. In Calabria a popular liqueur is made from pure liquorice extract. Liquorice is used in Syria and Egypt, where it is sold as a drink, in shops as well as street vendors. Properties of glycyrrhizin are under preliminary research, such as for hepatitis C or topical treatment of psoriasis, but the low quality of studies as of 2017 prevents conclusions about efficacy and safety. 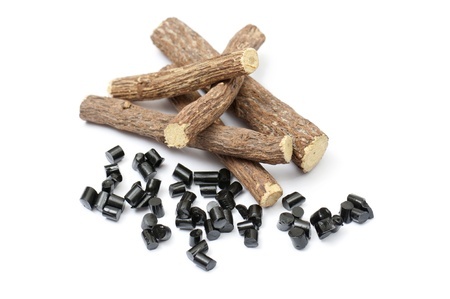 In traditional Chinese medicine, liquorice (G. uralensis) is known as "gancao" (甘草, literally "sweet grass"), and is believed to "harmonize" the ingredients in a formula. Liquorice has been used in Ayurveda in the belief it may treat various diseases, although there is no high-quality clinical research to indicate it is safe or effective for any medicinal purpose. Its major dose-limiting toxicities are corticosteroid in nature, because of the inhibitory effect that its chief active constituents, glycyrrhizin and enoxolone, have on cortisol degradation, and include oedema, hypokalaemia, weight gain or loss, and hypertension. The United States Food and Drug Administration believes that foods containing liquorice and its derivatives (including glycyrrhizin) are safe if not consumed excessively. Other jurisdictions have suggested no more than 100 mg to 200 mg of glycyrrhizin per day, the equivalent of about 70 to 150 g (2.5 to 5.3 oz) of liquorice confectionery. Liquorice should not be used during pregnancy. Liquorice is an extract from the Glycyrrhiza glabra plant which contains glycyrrhizic acid, or GZA. GZA is made of one molecule of glycyrrhetinic acid and two molecules of glucuronic acid. The extracts from the root of the plant can also be referred to as liquorice, sweet root, and glycyrrhiza extract. G. glabra grows in subtropical climates in Europe, the Middle East, and Western Asia. When administered orally, the product of glycyrrhetic acid is found in human urine whereas GZA is not. This shows that glycyrrhetic acid is absorbed and metabolized in the intestines in humans. GZA is hydrolyzed to glycyrrhetic acid in the intestines by bacteria. For thousands of years G. glabra has been used for medicinal purposes including indigestion and stomach inflammation. Some other medicinal purposes are cough suppression, ulcer treatment, and use as a laxative. Also, salts of GZA can be used in many products as sweeteners and aromatizers. The major use of liquorice goes towards the tobacco industry, at roughly 90% of usage. The rest is split evenly between food and pharmaceutics, at 5% of usage each (Federal Register, 1983). Liquorice extract is often found in sweets and many candies, some drugs, and beverages like root beer. It can also be used in chewing gum, tobacco products like snuff, and toothpaste. An increase in intake of liquorice can cause many toxic effects. Hyper-mineralocorticosteroid syndrome can occur when the body retains sodium, loses potassium altering biochemical and hormonal activities. Some of these activities include lower aldosterone level, decline of the renin-angiotensin system and increased levels of the atrial natriuretic hormone in order to compensate the variations in homoeostasis. Some other symptoms of toxicity include electrolyte imbalance, edema, increased blood pressure, weight gain, heart problems, and weakness. Individuals will experience certain symptoms based on the severity of toxicity. Some other complaints include fatigue, shortness of breath, renal failure, and paralysis. Many adverse effects of liquorice poisoning can be seen and most are attributed to the mineralocorticoid effects of GZA. Depending on the dose and intake of liquorice, serious problems and even hospitalization can occur. People with previously existing heart or kidney problems may be more susceptible to GZA and liquorice poisoning. It is important to monitor the amount of liquorice consumed in order to prevent toxicity. It is difficult to determine a safe level, due to many varying factors from person to person. In the most sensitive individuals, daily intake of about 100 mg GZA can cause problems. This is equivalent to 50 g liquorice sweets. However, in most people, they can consume up to 400 mg before experiencing symptoms, which would be about 200 g liquorice sweets. A rule of thumb is that a normal healthy person can consume 10 mg GZA a day.